Another one of your favorite Disney princesses has just had her baby, and today's the day when she will be able to take her beautiful baby home from the hospital. Ariel, the princess from Little Mermaid, had just had her baby with prince Eric, and today, she has just returned home from the hospital, when she realized that with all the excitement, they have forgotten to decorate the cute baby's room, or maybe, they just wanted to see what will it be, a boy or a girl, before taking such important decisions. Well, what do you girls say if you were to help Ariel decorate the cute baby's room? 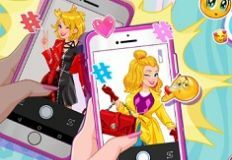 We really hope that you are excited about this game, because we know you girls have a great imagination and creativity, and we want you to apply it in this new game with Little Mermaid. Choose the furniture and other room decorating items for the baby's room. Enjoy!